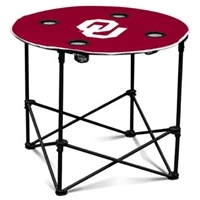 From tents, coolers, cozies, garbage cans, tent panels or anything else our hearts desire for your tailgate party. Don't just sit through the game on hard, uncomfortable bleachers. 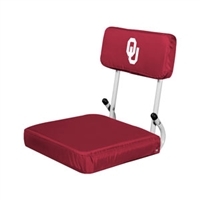 This University of Oklahoma Sooner Hardback Stadium Seat is a premium stadium seat providing optimal comfort for fans. Made with two hinged clips on the bottom to easily attach to bleacher seats and an angled back for increased comfort. Logo on the front and back of the backrest. Made of durable material to withstand a lot of use. Folds flat for easy storage and carrying. Don’t let a gusty autumn wind ruin your fun! 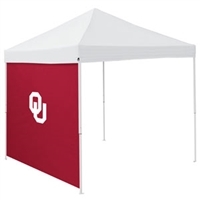 Be prepared for any weather condition in any season with this University of Oklahoma Sooner Side Panel . This side panel easily attaches to any 9' x 9' Logo Brands canopy with hook and loop straps on the top and side. Great for privacy, shade or weather protection. 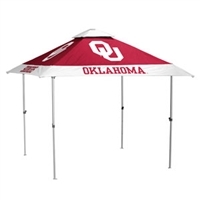 NOTE: This item does not fit Logo Brands Pagoda Tents. This is for 9x9' tents. The frame for the Pagoda tent is 8x8'. This item does not come with a tent frame or canopy. You'll be nice and warm under this Oklahoma Sooners Fleece Blanket as you root for Sooners. This soft Fleece Blanket features a sherpa-style fleece with a team workmark in the corner.